If you’ve read around this blog a bit, you’ll know that I’m not in the game of gratuitous self-promotion, but the other week, I astonished myself and the rest of the family by making an utterly sublime vanilla ice cream. I know it was good because the whole lot disappeared over the course of a couple of days, and I overheard one of the kids asking for that specific ice cream over the other tubs of commercial stuff in the freezer. Flushed with success, I decided to have another go, and on the basis that a vanilla ice cream is a blank canvas, albeit a very elegant one at that, I tried my hand at something more complicated. Gianduja gelata is an Italian classic, a hazelnut and milk chocolate ice cream brimming with flavour. The most important ingredient here is the nuts. Toast 185g of hazelnuts in a dry frying pan over a medium heat until they start to turn golden, then remove them onto a kitchen towel and rub them thoroughly to remove as much of the skin as possible. Use a food processor to chop the nuts very finely. Now to start getting at the hazelnut’s flavour…warm 250ml of cream, 250ml of whole milk, 150g of sugar and a quarter teaspoon of salt in a saucepan, and then add the chopped hazelnuts, stirring so that the nuts are fully soaked. Cover the pan with a lid or a plate and let it stand for an hour or so, so that the nuts steep in the cream and start to give it a wonderful hazelnut flavour. The backbone of this ice cream is milk chocolate. Much milk chocolate is terrible – be sure to seek out a good quality chocolate, with a reasonable amount of cocoa solids in it, at least 30%. Chop 115g of milk chocolate up finely and put them in a large bowl. Bring another 250ml of double cream to just under boiling point, and then pour it over the chocolate, stirring to help the chocolate melt. It should eventually look smooth and mocha coloured. Leave to one side for the time being. Pour the hazelnut-infused cream through a sieve straight into a pan. There’ll be plenty of cream soaked into the ground nuts, so push them down firmly in the sieve with your hands to extract as much of the cream as possible. When you’re done, throw the nuts away and gently rewarm the cream. Whisk together five large egg yolks in a bowl and then slowly pour the now warmed hazelnut milk and cream over them, whisking all the time to stop the eggs scrambling. Transfer the egg and hazelnut cream mix back into the pan and heat through, stirring and scraping all the time with a spatula until the mixture thickens. You’ve now got a hazelnut flavoured custard. Pour the custard through a sieve into the chocolate mixture, add an eighth of a teaspoon of vanilla extract and plunge the bowl into a sink of cold water to help it cool more quickly. Put the mixture into the fridge and chill until thoroughly cold before churning in an ice cream machine. This ice cream is incredible if it has stracciatella in it. All this is is dark chocolate, but it gives the hazelnut and milk chocolate ice cream another dimension entirely. To add stracciatella, just chop up 140g of dark chocolate, melt it and very, very slowly pour it into the ice cream machine just as the ice cream is about ready. You need to aim for a tiny, thin drizzle, so that the chocolate solidifies on impact with the cold ice cream and breaks up into thousands of tiny shards. Yep, all my own photos, and no, I’m not a chef…just an amateur. This sounds divine!! Love the photos too!! Oh wow this looks delicious! I always get the hazelnut flavor at a gelateria, it’s the best 🙂 Great pictures too! It looks absolutely delicious! Nicely done! This sounds amazing! There is just something about homemade ice cream – so creamy and delicious! Holy cow that sounds delicious! I love hazelnuts and chocolate together! 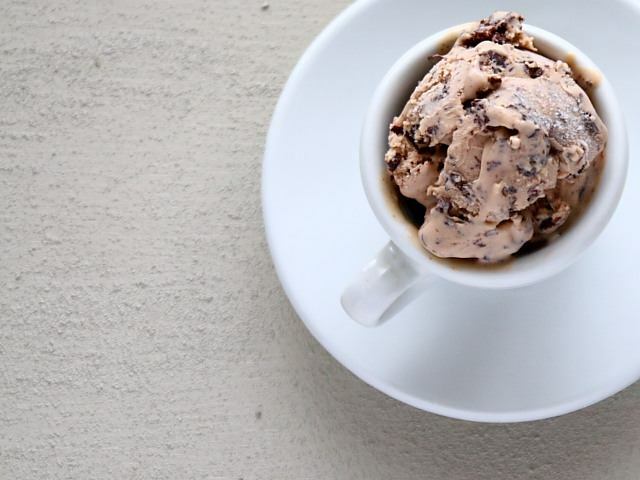 Love love love the photos–I’ve been missing gelato ever since I got back from vacation in Italy! I am in love. Ban the commercioal stuff from your home (love the measure of success by the family’s choice). Definitely worth the calories. Every one! I’ve checked your blog out a few times and just wanted to tell you that I think you do a fabulous job of it! I love your writing style, photos and theme, all in all, a great package. I look forward to reading more in the future. This is a gorgeous recipe also. Yum! The kids are good judges of great ice cream!